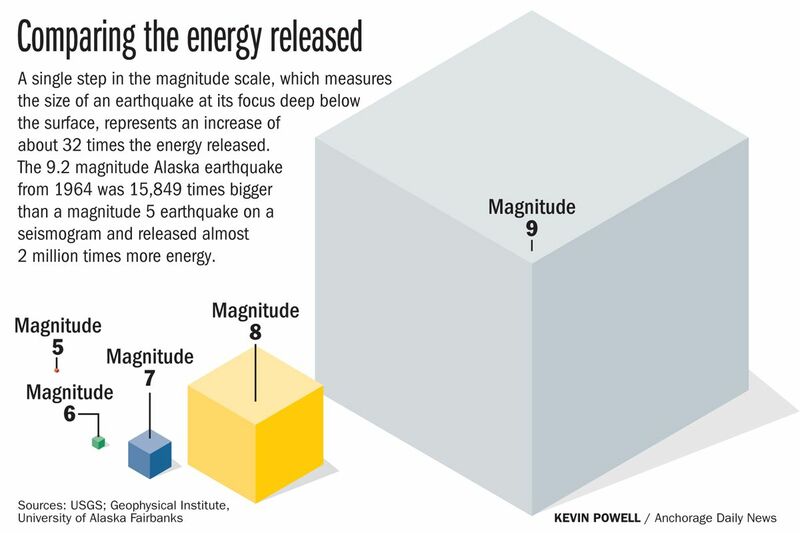 Here’s a handy visualization comparing the energy released by earthquakes of different magnitude. Back-to-back aftershocks — with preliminary magnitudes of 4.8 and 4.1 — jolted Southcentral Alaska around 12:45 p.m. Thursday, in case we weren’t already jumpy enough. But just how do those stronger aftershocks compare with last week’s magnitude 7.0 earthquake? Magnitude, according to the U.S. Geological Survey, “is a number that characterizes the relative size of an earthquake ... based on measurement of the maximum motion recorded by a seismograph." Looking at waves on a seismogram — the seismograph’s written record — the magnitude is comparing the amplitude of those waves. Seems simple enough. But describing how much bigger, and how much stronger, a quake is compared to another requires some math. Let’s compare the Nov. 30 magnitude 7.0 earthquake with Thursday’s 4.8 aftershock. That’s a difference in magnitude of 2.2. But how much bigger was the 7.0 earthquake? So, the 7.0 earthquake was about 158 times bigger than the 4.8 aftershock. Size or amplitude differences are big — but energy (or strength) differences are huge, USGS says. What we get as a result of these calculations: The Nov. 30 quake was about 158 times bigger than the 4.8 aftershock Anchorage felt Thursday — but it was nearly 2,000 times stronger, in terms of energy released. Want to skip the math? The USGS has created an online calculator that’ll speed up the process. Intensity, or an earthquake’s effect on the Earth’s surface, is another thing altogether. The Modified Mercalli Intensity Scale uses Roman numerals, from I to X, relating “increasing levels of intensity that range from imperceptible shaking to catastrophic destruction,” USGS says. Unlike strength, intensity isn’t calculated on a mathematical basis. Rather, intensity “is an arbitrary ranking based on observed effects.” Level III intensity, where shaking is weak, might be felt by people inside, with vibrations similar to those of a passing truck. People might not even recognize it as an earthquake. Level VII intensity, by comparison, has “very strong” shaking where some chimneys might break, considerable damage is done to structures of poor construction or design, and damage is “slight to moderate in well-built ordinary structures,” according to USGS. Intensity varies depending on where you’re located, so you may see a map with areas of different intensity levels. That contrasts with magnitude, which has a single number for an earthquake event. You can learn more about earthquakes on the USGS website. To track the latest aftershocks on the Alaska Earthquake Center’s website, click here.